Israeli forces continued with systematic crimes in the occupied Palestinian territory (oPt), for the week of 15 – 21 February, 2018. Israeli forces killed 2 children and wounded 2 others in the Gaza Strip, in cases where the soldiers’ lives were not in any danger. During the reporting period, Israeli forces killed 3 Palestinian civilians, including 2 children, in the Gaza Strip. They also wounded 56 others, including 18 children, in the West Bank and Gaza Strip. In the Gaza Strip as well, the Israeli forces continued to chase Palestinian fishermen in the Gaza Sea, target the border areas and carry out airstrikes against sites belonging to the Palestinian Armed Groups and vacant agricultural lands. In the Gaza Strip, in a new war crime and without any justification or reason endangering soldiers’ life, on Saturday afternoon, 17 February 2018, Israeli forces killed two Palestinian children and wounded 2 others after the Israeli forces fired artillery shells at them near the border fence with Israel in al-Shokah village, east of Rafah City. Investigations conducted by PCHR emphasize that the shelling violates the principle of distinction and military necessity, and use of force was unjustifiable, especially that the two killed children and the other wounded were only unarmed civilians who did not carry out any act that would endanger the life of Israeli soldiers. On Wednesday morning 21 February 2018, official sources in the Palestinian Ministry of Health declared that Ahmed Abu Helou (19) succumbed to his wounds after being hit with a bullet to the head during a protest organized east of al-Bureij in the central Gaza Strip on 16 February 2018 and described his wounds as serious. As part of targeting the border areas in addition to the abovementioned shelling crime that caused the death of 2 children and injury of 2 others, on 17 February 2018, Israeli forces fired artillery shells at a watchtower belonging to al-Quds Brigades (military wing of Islamic Jihad Movement.) The watchtower is 300 meters west of the border fence between the Gaza Strip and Israel, east of Khan Younis in the southern Gaza Strip. On the same day, Israeli forces fired an artillery shell at a control point belonging to al-Qassam Brigades (military wing of Hamas Movement). The control point is in an area located to the east of al-Burah area, northeast of Beit Hanoun in the northern Gaza Strip and 800 meters away from the border fence. Though no casualties were reported, civilians living near the sites panicked. On 19 February 2018, Israeli forces opened fire at Palestinian agricultural lands, east of al-Bureij and Gaza Valley Village. However, no casualties were reported. Moreover, 21 Palestinian civilians were wounded, including 5 children, after the Israeli forces fired bullets and tear canisters at them during protests where the protestors threw stones at the soldiers stationed along the border fence between the Gaza Strip and Israel. These demonstrations are organized in protest against the U. S. President’s decision to recognize Jerusalem as the capital of Israel and against the closure imposed on the Gaza Strip for the eleventh year. As part of targeting fishermen in the sea, the Israeli forces continued to escalate their attacks against fishermen in the Gaza Sea, indicating to the on-going Israeli policy of targeting their livelihoods. On 21 February 2018, a fisherman was hit with a rubber-coated metal bullet to the head when the Israeli gunboats opened fire at the fishing boats sailing within 3 nautical miles, west of Beit Lahia. In addition to this, PCHR monitored 11 other incidents; 6 in north-western Beit Lahia and 5 others in Western Soudaniyah, west of Jabalia. As part of the airstrikes, Israeli warplanes carried out airstrikes against military training sites and control points belonging to the Palestinian Armed Groups and vacant agricultural lands. PCHR’s fieldworkers monitored that the Israeli warplanes launched 21 missiles between 17 and 19 February 2018. In the West Bank, on 15 February 2018, 3 civilians were wounded; 2 with live bullets and one with a rubber bullet when Israeli forces moved into Nablus to carry out an arrest campaign in the city and a number of children and youngsters gathered to throw stones and empty bottles at the soldiers. On 16 February 2018, 4 civilians, including 3 children, were wounded with live bullets in Nablus in similar circumstances. On 20 February 2018, a civilian was hit with a bullet to the left thigh when Israeli forces moved into al-Duhaishah refugee camp, south of Bethlehem and civilians protested against them. On the same day, a civilian was hit with a rubber bullet to the head when Israeli forces moved into al-‘Issawiyah village, northeast of occupied East Jerusalem, amidst direct firing of rubber bullets and sound bombs. On 20 February 2018, a 13-year-old child was hit with a bullet to the thigh when Israeli forces moved into al-Janiyah village, northwest of Ramallah and a number of children and youngsters protested against them. Moreover, 22 Palestinian civilians, including 7 children, were wounded after the Israeli soldiers stationed at the entrances to the Palestinian residential areas in the West Bank fired live bullets and tear gas canisters directly at them during protests and stone-throwing. These demonstration are organized by Palestinian civilians in protest against the American President’s decision tor recognize Jerusalem as the capital of Israel and against the Israeli settlement activities and land confiscations. During the reporting period, Israeli forces conducted at least 81 military incursions into Palestinian communities in the West Bank while they conducted 12 incursions into Jerusalem and its suburbs. During those incursions, Israeli forces arrested at least 57 Palestinians, including 5 children, in the West Bank. Twenty-four of them, including 12 children, were arrested in Jerusalem and its suburbs. Those incursions happen in light of the cold and rainy weather as the Israeli soldiers force children, women and elderly people to stay outside their houses for hours or locked families in one room, preventing them to move in addition to other acts of harassment and use of police dogs in house raids. In the Gaza Strip, on 21 February 2018, Israeli forces arrested a Palestinian civilian after he crossed the border fence between the Gaza Strip and Israel. As part of settlement activity crimes, on 15 February 2018, Israeli forces established a security watchtower in the eastern side of Bab al-‘Amoud Square at the entrances to East Jerusalem’s Old City. Eyewitnesses said to PCHR’s fieldworker that the Israeli forces started unloading steel plates and equipment in the area to build a watchtower for the soldiers adjacent to Bab al-‘Amoud. They also started building 3 rooms on the stairways leading to the entrance of al-Bab al-‘Amoud as the rooms will be used for investigation, detention and to observe and control Palestinian civilians’ movement while coming in and out of Bab al-‘Amoud. On 21 February 2018, the Israeli municipality using hevy vehicles demolished ahouse and barrack for sheltering sheep in Sho’afat neighbourhood, north of occupied East Jerusalem. They belong to Saleh Abu Khudeir as the house was built on an area of 115 square meters, sheltering 6 family members while the farm was built on an area of 215 square meters. In the same context, they demolished a commercial facility “a beauty salon for women” belonging to Dawoud Muheisen. As part of house demolitions and notices, on 21 February 2018, Israeli forces levelled a 2-dunum land in al-Buq’ah area, east of Hebron, in the vicinity of a house belonging to ‘Atah Jaber (58). They also uprooted trees, levelled stone chains, damaged the winter crops, and levelled a 100-cubic-meter water well. The demolition came without any prior warning. On 20 February 2018, the Israeli issued orders to demolish and stop construction works in 3 houses in Ethna village, south of Hebron, and a barrack built of tin plates and used for sheltering sheep in Beit Z’etah area, east of Beit Ummar village, north of the city. They also confiscated a JCB Crane to transfer fodders and a 1500-cubic-meter agricultural pond used for irrigation. As part of the Israeli settlers’ attacks against the Palestinian civilians and their property, on 15 February 2018, a group of settlers from sneaked into Yitma village, south of Nablus. They carried out riots on the streets and attacked 3 vehicles parked in front of the owners’ houses and wrote racist slogans in Hebrew and singed by the “Price Tag” organization on the vehicles and punctured their tires. On the same day, a settler stationed at Za’atarah Checkpoint, south of Nablus, threw a stone at a car belonging Hussein Zain al-Deen (53) when he was on his way back home from the city to Majdal Bani Fadel village, southeast of the city, breaking the windshield. The Israeli soldiers who were guarding the settlers did not intervene to deter the settlers. On 20 February 2018, settlers broke the windshield of a car belonging to human rights activist in The Israeli Rabbis for Human Rights organization, Zakariah al-Sedah, who finished documenting the evacuation of “Avatar” settlement outpost in Abu Sbeih Mount, south of Bita village, south of Nablus. On 21 February 2018, around 15 settlers from “Yistihar” settlement established in the northern side of ‘Einabous village, south of Nablus, attacked Thafer Rayyan (27) who was grazing his 110 sheep in the outskirts of the village. One of the settlers hit him with a metal pipe on the back of his head and arms. They killed 20 sheep and wounded 17 others in addition to stealing dozes others. At approximately 11:00 on Wednesday, 16 February 2018, dozens of Palestinian civilians gathered in a square near Abu Sbaih Mount, south of Beta village, south of Nablus and performed Friday prayer there. Following the end of the prayer, civilians organized a protest and headed to the abovementioned mount where the Israeli outpost “Avtar”established in memory of the Israeli settler, who was killed near “Ariel” settlement on 05 February 2018. The protestors raised Palestinian flags and chanted slogans against the Israeli settlement and confiscation of lands policies. When the protestors approached the borders of the outpost, Israeli soldiers fired live and rubber bullets and tear gas canisters. As a result, a 28-year-old civilian was hit with a rubber bullet to the left thigh. Following the end of the same Friday prayer, dozens of Palestinian civilians gathered in the vicinity of Howarah checkpoint at the southern entrance to Nablus. They set fire to tires and put barricades on the street leading to the checkpoint and threw stones and empty bottles at Israeli soldiers. The soldiers fired live and rubber bullets and tear gas canisters at them. As a result, a child was hit with a live bullet wound to the back and a young man was hit with shrapnel to the chest. Around the same time, dozens of Palestinian children and young men gathered at the northern entrance to al-Birah. They threw stones and empty bottles at Israeli soldiers stationed at “al-Mahkamah” checkpoint near “Beit Eil” settlement, north of the city. The Israeli soldiers fired live bullets and rubber bullets, sound bombs and tear gas canisters at the protestors. As a result, 2 civilians, including a child, were wounded. One of them was him with a Two-Two bullet to the right shoulder and the other was hit with a Two-Two bullet to the left foot. They were transferred via a n ambulance belonging to Palestine Red Crescent Society (PRCS) to Palestine Medical Complex in Ramallah. Doctors classified their injuries as moderate. Following the same Friday prayer, dozens of Palestinian civilians and International and Israeli human rights defenders organized a protest in al-Nabi Saleh village, northwest of Ramallah. They threw stones and empty bottles at Israeli soldiers stationed at the village entrance. The Israeli soldiers fired live bullets, rubber-coated metal bullets, sound bombs and tear gas canisters at the protestors. As a result, a 15-year-old child sustained a metal bullet wound to the right foot and a civilian was hit with a rubber bullet to the right foot. he was transferred to Yasser Arafat Hospital in Salfit via a PRCS ambulance to receive medical treatment. Following the end of Friday prayer, dozens of Palestinian civilians and International and Israeli human rights defenders organized a protest in al-Mazra’ah al-Gharbiyah village, northwest of Ramallah. They threw stones and empty bottles at Israeli soldiers stationed at the village entrance. The Israeli soldiers fired live bullets, rubber-coated metal bullets, sound bombs and tear gas canisters at the protestors. As a result, 4 civilians, including a child, were wounded. One of them was hit with a Two-Two bullet, 2 civilians were hit with rubber bullets and one civilian was hit with a tear gas canister to the head. At approximately 13:20, Palestinian civilians and International activists organized a protest in the center of Kafer Qadoum village, northeast of Qalqiliyah and made their way to the eastern entrance to the village, which has been closed by the Israeli forces for 15 year. When the protestors approached the abovementioned entrance, Israeli forces fired live and rubber bullets, sound bombs and tear gas canisters at the protestors. As a result, 3 civilians, including a child, were hit with rubber bullets to their lower limbs. At approximately 14:30 on the same Friday, dozens of Palestinian youngsters gathered at the southern entrance to Jericho. They threw stones and empty bottles at Israeli soldiers stationed at military checkpoint established near the entrance. The Israeli soldiers fired live ad rubber bullets, sound bombs and tear gas canisters at them. as a result, 5 civilians, from ‘Aqabet Jaber refugee camp, south of the city, were hit with rubber bullets to their lower limbs. They were transferred to Jericho Governmental Hospital to receive medical treatment. Doctors classified his injury as moderate. At approximately 16:30, dozens of Palestinian civilians protested at the northern entrance to Qalqiliyah “Eyal” crossing. They threw stones and empty bottles at Israeli soldiers stationed at the entrance. The soldiers fired live and rubber bullets and tear gas canisters. As a result, a 13-year-old child was hit with a rubber bullet to the head. At approximately 16:50, dozens of Palestinian civilians protested at the northern entrance to Salfit. They threw stones and empty bottles at Israeli soldiers. The soldiers fired live and rubber bullets and tear gas canisters at the protestors. As a result, a 15-year-old child was hit with a rubber bullet to the neck. At approximately 15:30 on Sunday, 19 February 2018, dozens of Palestinian civilians protested at the northern entrance to Salfit. They threw stones and empty bottles at Israeli soldiers. The soldiers fired live and rubber bullets and tear gas canisters at the protestors. As a result, a 21-year-old civilian was hit with a live bullet to the waste. At approximately 16:00 on the same Sunday, a group of Palestinian civilians moved into joyous village, northeast of Qalqiliyah and headed to the annexation wall gate, west of the city. The threw stones at Israeli soldiers. The soldiers fired live and rubber bullets, sound bombs and tear gas canisters at them. As a result, a 16-year-old child was hit with a live bullet to the thigh. He was transferred to Dr. Thabet Thabet Hospital in Tulkarm to receive medical treatment. At approximately 13:00 on Friday, 16 February 2018, dozens of Palestinian youngsters made their way to the border fence between the Gaza Strip and Israel, east of Khuza’ah and ‘Abasan al-Kabirah and al-Jadidah villages and al-Sarij area, east of al-Qararah, east of Khan Yunis in the southern Gaza Strip, in protest against the U.S President Donald Trump’s declaration of Jerusalem as the capital of Israel. The clashes continued in the area for hours during which the Israeli soldiers stationed along the border fence and sporadically fired live bullets and tear gas canisters. As a result, 4 civilians were hit with live bullets. They were transferred to Gaza European Hospital, southeast of the city to receive medical treatment. Doctors classified their injuries as moderate. Around the same time, dozens of Palestinian civilians gathered in the vicinity of al-Sheja’eya neighborhood intersection, east of Gaza city and then headed to the border fence between the Gaza Strip and Israel (near former Nahel Oz). The protestors threw stones at Israeli soldiers stationed along the border fence. The soldiers fired live bullets, rubber-coated metal bullets and tear gas canisters at them. As a result, 2 civilians were wounded. One of them was hit with a live bullet to the right foot and the other was hit with a tear gas canister to the head. They were transferred by ambulances to al-Shifa Hospital in Gaza City to receive medical treatment. Around the same time, dozens of Palestinian youngsters made their way to the border fence between the Gaza Strip and Israel in the northern Gaza Strip. The youngsters approached the security fence and threw stones at Israeli soldiers stationed along the border fence. The soldiers stationed in military watchtowers and in their vicinity at Beit Hanoun “Erez” crossing, northwest of Beit Hanoun village, north of Buret Abu Samrah, north of the abovementioned village, and stationed in the east of the Islamic Cemetery, east of Jabalia, fired live bullets, rubber- coated metal bullets and tear gas canisters at the protestors. As a result, 13 civilians, including 4 children, were wounded. Seven of them were hit with live bullets, 4 were hit with tear gas canisters, and 2 were hit with shrapnel. The wounded civilians were transferred by ambulances belonging to PRCS to the Indonesian and Beit Hanoun Hospitals to receive medical treatment. Doctors there classified their injuries between moderate and minor. At approximately 14:00 on the same Friday, dozens of Palestinian children and young men made their way to the border fence between the Gaza Strip and Israel, east of al-Buraij refugee camp in the central Gaza Strip, in protest against the U.S President Donald Trump’s decision to recognize Jerusalem as the capital of Israel. The protestors set fire to tires and threw stones at Israeli soldiers stationed behind sand barriers along the abovementioned border fence. The Israeli soldiers fired live bullets and tear gas canisters at them. As a result, 3 civilians, including a child, were wounded. One of them was hit with a live bullet to the head and his injury was classified as serious, the child was hit with a live bullet to the right leg and 1 civilian was hit with tear gas canister shrapnel. On Wednesday morning, 21 February 2018, official sources in the Ministry of Health announced that one of the wounded civilians namely Ahmed Mohammed ‘Abed Rabuh Abu Helou (19) succumbed to wounds he sustained as he was hit with a live bullet to the head. At approximately 02:00 on Thursday, 15 February 2018, Israeli forces moved into al-Ram village, north of occupied East Jerusalem. They raided and searched a house belonging to Shadi Mohamed Abu Gharbiyia (16) and arrested him. At approximately 01:00 on Sunday, 18 February 2018, Israeli forces moved into al-‘Issawiyia village, northeast of occupied East Jerusalem. They raided and searched houses from which they arrested Mohamed Ibrahim Hamdan (14) and Mahmoud Fayiz Mahmoud (42). At approximately 02:00, Israeli forces moved into Hizmah village, east of occupied East Jerusalem. They raided and searched houses from which they arrested Mahmoud Talal Jouda (13) and Bashar Suliman ‘Askar (19). At approximately 19:00 on Sunday, Israeli forces arrested Shadi Fawzi Muhasin (21), from al-‘Issawiyia village, northeast of occupied East Jerusalem, while he was in the French Hill area, north of the city. The Israeli forces raided Muhasin’s house several times in order to arrest him, but in vain. As a result, the Israeli forces handed his family a summons for Shadi to refer to the Israeli Intelligence Service. At approximately 00:00 on Monday, 19 February 2018, Israeli forces moved into Silwan village, south of occupied East Jerusalem. They raided and searched houses from which they arrested 5 civilians, including 3 children. The arrested persons were identified as Ahmed Ziyad Zaidani (14), ‘Odai ‘Adnan Ghaith (17), Mohamed Samer Sarhan (14), Musalam Mousa ‘Odah (18), and Ahmed Diyaa Ghaith (20). At approximately 02:00 on Monday, Israeli forces moved into al-Ram village, north of occupied East Jerusalem. They raided and searched a house belonging to Mohamed Sa’adah (24) and arrested him. At approximately 01:00 on Tuesday, 20 February 2018, Israeli forces moved into al-Ram village, north of occupied East Jerusalem. They raided and searched a house belonging to Khalil Ramzi Helis (15) and arrested him. At approximately 02:00, Israeli forces moved into Ras al-‘Amoud neighborhood, east of occupied East Jerusalem’s Old City. They raided and searched a house belonging to Ma’moun Abdullah al-Razem (41) and then arrested him. At approximately 17:00 on Tuesday, 20 February 2018, Israeli forces moved into al-‘Issawiyia village, northeast of occupied East Jerusalem. They then stationed next to Forty Mosque in the center of the village. The Israeli forces then indiscriminately fired rubber-coated metal bullets and dozens sound bombs. As a result, Mostafa ‘Amer Mostafa (28), was hit with a rubber-coated metal bullet to the head and was then taken to the hospital. Mohamed Abu al-Humus, Member of the Follow-up Committee in the village, said that Mostafa was hit with a rubber-coated metal bullet behind his ear while he was in front of his restaurant in the center of the village. He added that Mostafa fainted and was then taken by an ambulance to a health center to receive medical treatment. Abu al-Humus added that an Israeli vehicle stopped the ambulance carrying Mostafa and confiscated his ID. At approximately 01:00 on Wednesday, 21 February 2018, Israeli forces moved into Sho’fat Refugee Camp, north of occupied East Jerusalem. They raided and searched a house belonging to former prisoner Omar Mohamed Muhassin and then arrested him. At approximately 02:00, Israeli forces moved into al-‘Issawiyia village, northeast of occupied East Jerusalem. They raided and searched a house belonging to ‘Atif ‘Obaid and then arrested his two sons Ahmed (19) and ‘Atif (21). At approximately 04:00, Israeli forces moved into occupied East Jerusalem’s Old City. They raided and searched houses from which they arrested ‘Obadah Najeeb (21) and Mahmoud Najeeb (20). At approximately 15:00 on Wednesday, 22 February 2018, Israeli forces moved into Sho’fat refugee camp, north of occupied East Jerusalem’s Old City. They then chased dozens of students while leaving their schools and indiscriminately fired tear gas canisters at them. As a result, many students suffered tear gas inhalation. Moreover, the Israeli forces arrested 5 children identified as Riyad al-Salimah, Mahmoud ‘Obaido, Osama Abu Sunienah, Diyab Qirsh, and Ibrahim Kayalah. On Tuesday, 15 February 2018, Israeli forces established a military watchtower in the eastern side of Bab al-‘Amoud yard, at the entrances to occupied East Jerusalem’s Old City. Eyewitnesses said to PCHR’s fieldworkers that on Thursday, the Israeli forces unloaded steel plates and tools in Bab al-‘Amoud area to establish a military watchtower for the Israeli soldiers adjacent to Bab al-‘Amoud entrance. Moreover, they stat building 3 rooms on stairways leading to Bab al-‘Amoud entrance for investigation, detention, controlling and observing Palestinians while entering and exiting Bab al-‘Amoud, and following up protests organized in the area. In late 2017, the Israeli authorities revealed an Israeli security plan for Bab al-‘Amoud, which will change the infrastructure of Bab al-‘Amoud, including lighting, Palestinians’ passing, and setting 40 surveillance cameras to monitor what happens from all sides. They also want to establish more checkpoints near Bab al-‘Amoud. At approximately 11:00 on Wednesday, 21 February 2018, a large force of Israeli soldiers and members of Special Units accompanied with the Israeli Municipality staff and a bulldozer moved into Sho’fat neighborhood, north of occupied East Jerusalem. The Israeli forces closed some streets and then surrounded a house belonging to Saleh Abu Khadir and his farm. The Israeli Municipality workers vacated sheep from the farm and other contents and then demolished the house. The Israeli Municipality staff then completely demolished nearby houses. Saleh Abu Khadir said that his 115-square-meter house was sheltering 6 members while the area of his farm was 215 square meters. He added that his house was built since 2006 and he along with his family lived in it since 2012. Saleh added that the Israeli Municipality issued a decision in October 2017 to demolish his house and level his farm. He clarified that he could delay the demolition and in January 2017 the court issued a decision to stop the demolition, but the two facilities were demolished without a prior warning. He also said that the Israeli Municipality imposed a construction fine on him of NIS 50,000 and he paid it. In the same context, the Israeli forces moved into al-Ashqariyia neighborhood in Beit Haninah, north of occupied East Jerusalem. They surrounded a commercial facility (Beauty Salon for Women (belonging to Dawoud Muhassin and then demolished it. Muhassin clarified that the 30-square-meter salon, where his wife works, was tin-roofed and built of bricks. At approximately 09:00 on Tuesday, 20 January 2018, Israeli forces accompanied with military vehicles and a vehicle of the Israeli Civil Administration moved into Beit Za’tah area, east of Beit Ummer village, north of Hebron. The Israeli Civil Administration officers took photos of an agricultural barrack built of tin plates on an area of 400 square meters. The barrack is used for breeding livestock and belongs to Na’iem Hamidan Ahmed Abu Mariyia. The Israeli forces also fixed to a rock near the barrack a notice to stop the construction works and then confiscated a mounted-crane truck, which was parked in the area and belongs to Na’iem. The mounted-crane truck was then taken to a detention facility in “Gush Etzion” settlement, south of Bethlehem. Moreover, the Israeli Civil Administration officers handed Ghassan Mohamed Brigheth a notice to stop working in a 1500-cubic-meter agricultural pond used for irrigating plantings. The agricultural pond cost is NIS 15,000. At approximately 10:00 on Tuesday, Israeli forces accompanied with 2 military vehicles and a vehicle of the Israeli Civil Administration moved into Ethna village, south of Hebron. They stationed in Wad al-Naqqa area, west of Ethan village. The Israeli Civil Administration officers handed ‘Alaa Batran a final order to stop construction works in his 70-square-meter house under the pretext of non-licensing. In Khelit Ibrahim area, the Israeli Civil Administration officers handed Shadi ‘Adnan Abu Zaltah a notice to stop construction works in his 140-square-meter under-construction house. They also handed Sufian Abed Rabbu Abu Zaltah a similar notice to stop construction works in his 150-square-meter under-construction house. The abovementioned houses are located in Area (C) according to Oslo Accords 1993. At approximately 10:00 on Wednesday, 21 February 2018, Israeli forces accompanied with military vehicles, a vehicle of the Israeli Civil Administration and a digger moved into al-Baq’a area, east of Hebron. The Israeli soldiers deployed in the vicinity of a house belonging to ‘Ata Jaber (58) and then leveled a 2-dunum surrounding his house. The Israeli forces uprooted all trees planted in the land, demolished stone chains, damaged the winter crops, and demolished a 100-cubic-meter well without a prior warning. On Thursday, 15 February 2018, a group of Israeli settlers sneaked into Yatmah village, south of Nablus. The Israeli settlers carried out riots on the village’s streets and attacked 3 vehicles parked in front of the owners’ houses. The Israeli settlers also wrote hostile slogans on the vehicle in Hebrew signed by “Price Tag” organization. They also punctured the vehicles’ tires. The abovementioned vehicles belong to Hisham Ahmed Snobar, Waleed Fawzi Salah Muhsen, and Abdullah Mohamed Fa’ieq Snobar. On Thursday, 15 February 2018, Hussain ‘Abed Zain al-Deen (53) was driving his car along with his friend Mohamed Zain al-Deen (42). They passed through Za’tarah checkpoint, south of Nablus, heading to their village Majdal Bani Fadel, southeast of the city. While the Israeli forces were stationed at the checkpoint, around 7-8 Israeli settlers were standing at the checkpoint’s left side. One of the settlers threw a stone at Hussain’s car and broke the windshield. The Israeli forces did not intervene to deter the settlers and Zain al-Deen continued to drive until arriving at his village. At approximately 06:30 on Tuesday, 20 February 2018, Zakaria Muhi al-Deen al-Sedah, Human Rights Activist in Rabbis for Human Rights, headed in his car to cover the evacuation of “Avtar” outpost in Abu Subeih Mount, south of Bitah village, south of Nablus. 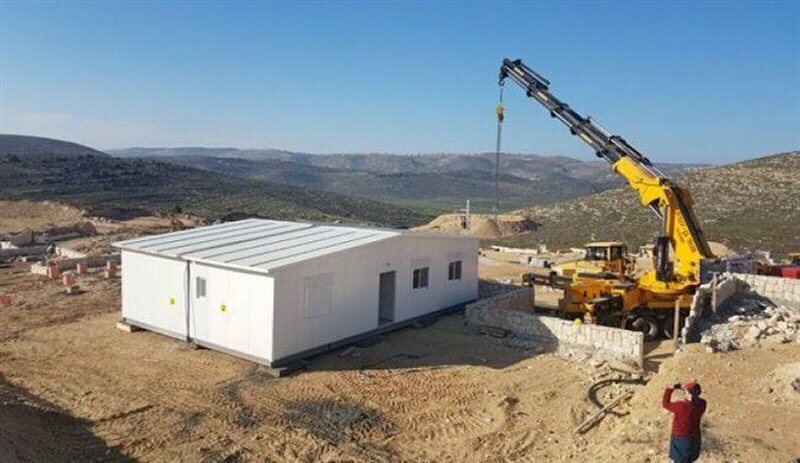 Fifteen days earlier, the Israeli settlers in the outpost placed 8 mobile homes and named them Avatar in memory of an Israeli settler, who was killed in Ariel attack on 05 February 2018. At approximately 07:25, after the Israeli forces vacated the outpost, al-Sedah drove his car and then headed to the southwestern side, reaching the Main Street 505. After he drove 500 meters away from the “Avtar” outpost, he was surprised with an Israeli settler, who was walking towards Za’tara checkpoint, throwing a stone at his car and broke the windshield. At approximately 14:00 on Wednesday, 21 February 2018, around 15 Israeli settlers from “Yitzhar” settlement established on ‘Ainabous village lands, south of Nablus, attacked Zafir Mahmoud Abdullah Rayan (27) while grazing around 110 sheep in al-Sawma’ah area in the outskirts of ‘Ainabous village. An Israeli settler along with 4 other settlers hit Zafir with a metal pipe at the back of his head and at his arms while the 10 others attacked the sheep. Some of the settlers had sharp tools and slaughtered 20 sheep and wounded 17 others in addition to stealing the rest of the sheep before the arrival of civilians and the victim’s relatives. It should be noted that the Israeli settler stole the sheep while the Israeli forces were in the area, in addition to the settlement’s guard, who pointed his rifle at the victim’s chest and threatening him to open fire at him in the presence of the Israeli soldiers and his relatives when the victim said for him that you saw what happened to me and did not do anything. After that, the Israeli police arrived at the area and took photos of the killed and wounded sheep and wrote down the number of lost sheep. Meanwhile, Zafir fainted and was then taken via his brother’s car to Ibn Sina Hospital in Hawarah village and was then transferred to Rafidia Hospital in Nablus. After undergoing X-ray and medical tests, bruises were found in his neck, under his head, arms and throughout his body, so he received the necessary medical treatment. It should be noted that the stolen sheep were not returned until the reporting period.